Perhaps you have always dreamed of living out the Sound of Music in the Alps or climbing the Matterhorn, but a trip to Europe has never been possible. Why not enjoy a taste of the Alps at one of our quaint Gatlinburg chalets? These cozy A-frame cabins are surprisingly luxurious and situated with great views of the Smoky Mountains, perfect for a snowy winter getaway. A model for many of the chalets in Gatlinburg, OberBaden looks straight out of a fairy tale, nestled into a hillside and painted in beautiful green with red accents. Although its exterior might trick you into thinking it has close quarters inside, OberBaden has four bedrooms across three floors and can sleep up to nine people. With three bathrooms, there is plenty of privacy for couples or families travelling together. Gather everyone in the great room, with its high ceilings, comfy sofas, flat-screen television, and fireplace and catch up with your friends or make memories with your family. With a full kitchen and large dining room table, you can enjoy meals together and save some money on taking everyone to restaurants. You will find plenty to do without leaving your cabin. There is a downstairs game room with full-size pool table and 50-inch television with comfy sofas on which to lounge, plus a bar, refrigerator, and a second fireplace. Outside are multiple decks, one with a hot tub, perfect for watching the stars come out as you soak in the crisp mountain air. 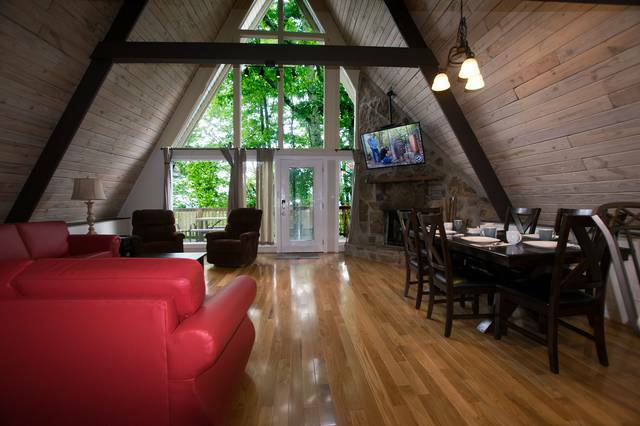 One of the largest chalets in Gatlinburg is Mountain View, a four-bedroom cabin that can accommodate 12 in comfort. The beautiful open-floor main room will catch your eye as soon as you open the front door. It has cathedral ceilings and plenty of places to gather, from the fireplace set in a huge hearth to comfy chairs and sofas. There is a large and modern dining room table to enjoy meals together with a sizeable kitchen, as well. You will be drawn to the lower deck, with a hot tub on the covered porch. Turn on the bubbles and let your stresses fall away as you breathe in the fresh air and enjoy the view over the Smokies. The master bedroom in the loft has its own private deck, too, should you need to slip away for some quality time with your sweetheart. Meanwhile, the main level has a wraparound porch with picnic table and lounge chairs, offering another option to eat as a group. The lower level boasts its own cozy game room with a fireplace of its own. Start a game of cards on the table or have a friendly competition on the pool table. Each of the rooms also has DirecTV so there is no fighting for the remote. Both of these cabins are pet friendly, so save on kennel fees and inconvenience and let your dogs enjoy a mountain vacation as well. With our winter specials, relaxing in one of our Gatlinburg chalets is even more affordable, so be sure to check out discount options before you book.